Power Place Coaching is one of Deborah's specialities: Supporting and guiding others in taking and finding their power place on Earth. 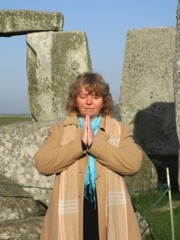 Deborah has lived at her power place in England since 2003 and it is one of the greatest joys in her life and also a matter close to her heart to support others in finding and taking their place to unfold the potential of their heaven here on Earth. This is done in a one-to-one session. It helps you to connect with the original energy of your power place which is an equivalent to your place in heaven. It brings you into contact with the inherent potential of your power place. £120.00. Coaching Sessions support you to connect with your own power and to transform blockages. Part of the coaching sessions can be starlight readings, energy healing techniques and methods and diving into your divine potential to help you find the right form and space for your power place. £200.00. If you would like to find out more about the potential of your power place, your own history with it and what steps there are to take according to your own divine natural law, you can order a reading. If you have any questions or would like to book a session, please get in touch!